What exactly is graphite? And can investors really profit from graphite investing? Here are some brief answers to those questions and more. Graphite has since fallen from favor a little. 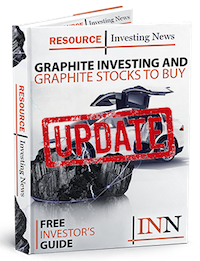 Nevertheless, the long-term outlook for graphite remains positive, and some savvy investors are entering the space now in anticipation of future gains. Flake graphite has become especially important since early 2014, when Tesla (NASDAQ:TSLA) CEO Elon Musk announced that his company would be building a lithium-ion battery gigafactory. Graphite is used in lithium-ion battery anodes, and the announcement immediately sparked predictions of how much of the metal the gigafactory might require. In terms of supply, the majority of graphite comes from China. The Asian nation produced 780,000 MT of the metal in 2017, far ahead of India, the world’s second-largest producer. That said, in recent years there have been some concerns about the security of Chinese graphite supply. Back in 2013, the Chinese government began making an effort to streamline graphite production in the country, with part of the process being to take polluting producers back online. While some were expected to come back online, weak graphite market conditions have hampered that process. Luckily, some industry experts are looking to increase transparency in the graphite sector. Benchmark is one company that provides accurate and up-to-date information on graphite pricing. To help investors decide which graphite companies to invest in, we’ve put together a list of the top graphite companies on the TSXV, TSX and ASX with year-to-date gains and market caps above $10 million. Click here to see the list. FYI TON are in administration! Unsubscribe. Thank you, we have edited the article accordingly.